KAZUHIRO NOGI/AFP/Getty ImagesPrime Minister Shinzo Abe. Prime minister Shinzo Abe is losing his grip on power as a cronyism scandal and cover-up gains steam in Japan. 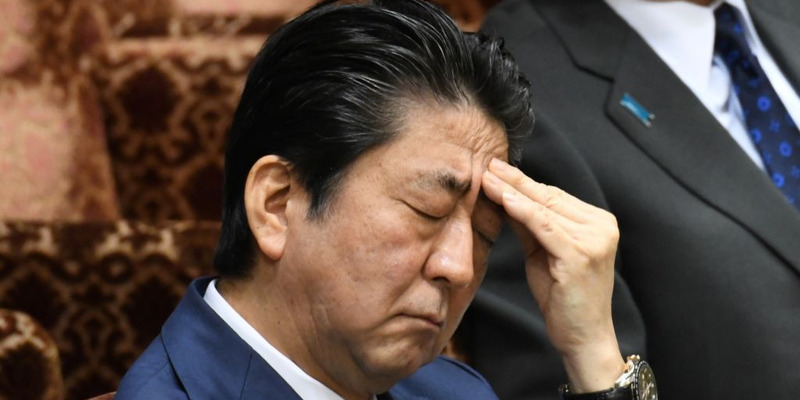 The scandal involves a school with ties to Abe’s wife that was given an 85% discount on state-owned land, and a new admission from the finance ministry that related documents were doctored to remove her name. Abe’s support is sliding and a new poll says nearly half of all respondents think Abe should quit. The drama comes as Abe deals with Tokyo’s falling international relevance in discussions with North Korea that directly affect Japan’s national security. 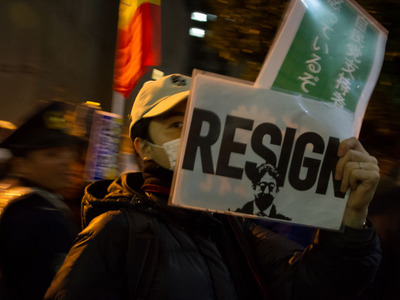 Prime Minister Shinzo Abe is facing his biggest crisis since coming to power in 2012, with a cronyism scandal and cover-up now gaining steam in Japan. She was previously accused of giving the school a cash donation from her husband. The scandal hit headlines again this month after an internal investigation by the finance ministry found documents related to the sale were modified to remove the name of Abe and his wife, including a mention of her attendance at a meeting between the department and school administrators. Damon Coulter / Barcroft Media via Getty ImagesA man holds a sign saying ‘Resign’ as hundreds of students and other activists protest outside the Japanese prime Minister’s office on March 23, 2018. After the report was released, a finance ministry employee committed suicide. He left a note saying he feared he would be forced to take the blame for the improperly modified documents. Abe has denied accusations that he and his wife were involved in the sale. Despite this, nearly half of the country wants Abe to resign. According to a new poll by TV Asahi, 48% of respondents said Abe and his government should quit. Support for the prime minister slid 11 percentage points since last month. Abe’s plummeting popularity could not have come at a worse time. Despite forging a close personal relationship with US President Donald Trump – who had agreed with Abe’s hardline approach to North Korea – Japan has suddenly found itself on the outs. And despite a number of North Korea’s ballistic missiles being launched over Japan in the recent past, it is the US, South Korea, and China that have emerged as the countries set to lead peace discussions with North Korea. Tokyo had to reach out to Washington just to ask for talks with Kim Jong Un, a move likely driven by fear.